While visiting last month in New Buffalo, a summering village along Lake Michigan’s southeastern coast, I learned that realtors and developers were preparing a campaign to significantly weaken or entirely repeal the 31-year-old state law that protects Michigan’s magnificent fresh water sand dunes. The reason: the law was deemed to be an affront to “property rights” and an impediment to the development of some of the most compelling maritime geography on the planet. Earlier this year, while researching a paper for a group of property owners and environmental advocates in Saugatuck, I’d learned that an Oklahoma oil and natural gas industry billionaire named Aubrey McClendon was financing a Lansing lobbying firm’s work to make the same case to a group of sympathetic Republican lawmakers in the state House and Senate. A year ago Mr. McClendon spent $39.3 million to buy 402 acres of untouched and magnificent dunes and wetlands at the mouth of the Kalamazoo River in Saugatuck. His apparent, though as yet unannounced goal: Build a gated community of luxury beachside homes. The land he purchased lies within the zone protected by the Sand Dune Protection and Management Act. Unless it’s amended and seriously weakened, he’s going to have a very hard time putting any new homes there. 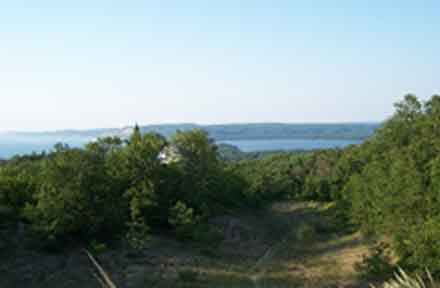 Two days ago I thought about the impending attack while hiking through a thick hemlock forest to the summit of Old Baldy (see pix), the tallest sand dune in Benzie County, Michigan, where I live. 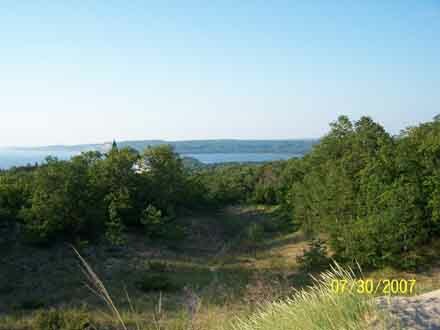 The walk starts on a narrow dirt road, climbs gradually through a forest now permanently protected as a natural refuge, and then takes you up a steep sand face to the top of a ridge overlooking Lower Herring Lake, Lake Michigan, and the sand dunes and high bluffs flanking Frankfort, some five or six miles north. It’s a tableau of brilliant blue water, warm blue sky, yellow sand, and green forest. In all of the coastal world that I’ve traveled, from California to the Olympic Peninsula to Prince William Sound. From Acadia National Park to Martha’s Vineyard to the South Carolina Low Country. From coastal Denmark to Portugal to Morocco to Greece. In those places and more I’ve never seen a more beautiful coast than the one visible from that spot. Michigan’s dunes, which stretch for 270 miles along Lake Michigan, form the longest and tallest chain of freshwater dunes in the world. A great moderate Republican Governor ,William G. Milliken, assured their conservation in 1976 with the passage of the Sand Dune Protection and Management Act. The law restricts construction of roads and infrastructure on steep slopes, and has helped to preserve a scenic and ecologically crucial resource that also has sustained Lake Michigan’s recreational economy. Our state, though, is enduring the most treacherous economic circumstances since the early 1980s. Our Democratic Governor, Jennifer M. Granholm, who happens to be sympathetic to resource conservation and a warm and intelligent human being, is nevertheless unwittingly (I hope) prompting a kind of economic free for all at the grassroots in Michigan with some reckless rhetoric about jobs and the economy. Ms. Granholm’s favorite slogan for several years now has been her vow to “go anywhere and do anything” to secure the state new jobs. That message has permeated the industrial community, the development community, the utility industry, and local governments. It’s producing unethical, unwelcome, and potentially dangerous consequences across the state. In Presque Isle County, where a utility is proposing a new coal plant, a 17-year elected county commissioner who’s helped to guide the project also is a paid board member of the utility who collected more than $25,000o from the company in 2005, according to the most recent Federal IRS tax filing. With his behind the scenes support, the county issued land use permits for the plant without even knowing how big it would be. Almost noone said a word. Similarly in Grayling, elected and appointed government leaders signed confidentiality agreements put before them by an amusement park developer even as many of those same officials were involved in the process of issuing land use and other permits. And along the southern Lake Michigan coast, developers and realtors are convinced it is perfectly reasonably to team up with an out of state oil billionaire to finance and execute a surreptitious inside-Lansing campaign to diminish the Sand Dune Protection Act. My walk up Old Baldy convinced me that I will do everything in my capacity to make sure that won’t happen. I helped construct local campaign messages for the defeat of Washington state’s I-933. Contact me and I’ll help you defeat these people. I’ve been hiking Baldy a bunch this summer, and I agree, our dunes are worth saving. Good luck!